Nominate your company/brand for listing on the British Travel Awards consumer voting form by completing the application form below. You can view the category list short form by selecting the above tabs; however we strongly advise that you read the Award Categories section - where you can check this year's categories and qualifying entry criteria - before you register. This should be the person we contact for all matters relating to the British Travel Awards 2019. Please enter the link to your news or blog site if you wish content to be considered for inclusion in BTA Connect. If your nomination application is for listing in Package Holidays & Tours by Type and/or Package Holidays & Tours to Destinations sector or Best UK Family Holiday Company please enter to the number of passengers/guests per year to the nearest 1,000 (this should be the overall figure for the company/brand - NOT related to the individual award category(s) entered) and check the appropriate button. If your nomination application is for listing in Best Independent Travel Agency please enter the number of retail outlets (companies/brands with more than 100 shops should enter Best National Travel Agency) and check the appropriate button. If your nomination application is for listing in Best UK Airport please enter the number of passengers carried in the last 12 months accounting period to the nearest 1,000 and check the appropriate button. If your nomination application is for listing in Best Villa Holiday Company and/or Best UK Holiday Cottage Booking Company please enter value of sales in last 12 months accounting period to the nearest £1,000 (this should be the overall figure for the company/brand - NOT related to the individual award category(s) entered) and check the appropriate button. If your nomination application is for listing in Best Winter Sports Accommodation Provider please enter the number of guests per year to the nearest 1,000 and check the appropriate button. . 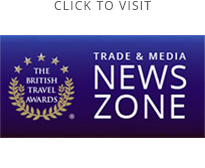 If you do not enter the required figure in the appropriate box(s) your company or brand will be considered as large or determined by the British Travel Awards. To register your details and proceed to the category selection page please click the submit button. By clicking the submit button you confirm that you have read and accept the award category listing terms and conditions and understand that a registration fee of £150.00 + VAT will be payable for every category entered. Your remittance can be made by BACS/online payment (account details will be printed on your registration confirmation invoice), cheque or over the telephone via debit/credit card.